Mounting Brackets are designed to save you time and money when laying out your fixture. All Mounting Brackets are made of low carbon steel, C-1018, which is not heat-treated. This allows you to custom fit or weld the brackets into your fixture. 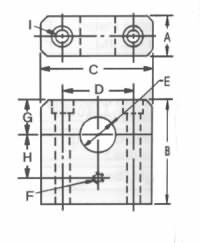 The cylinder clamping area is concentric to the OD of the various cylinders to avoid distortion of the cylinder walls which may cause damage to the piston. Spacers may be used to add height to the cylinders when using Jergens Mounting Brackets.